With more than two million rides and only a handful of reported crashes, bike-share in New York appears to be putting together an impressive safety record. In London and Paris, fatal bike-share crashes, while very rare, have mostly involved large vehicles like buses and trucks. When Citi Bike launched, the “Bike Smart” brochure sent to all annual members included information about truck blind spots, and DOT regularly hosts demonstrations (including at Summer Streets) using its dump trucks to educate the public about blind spots, but Nicole Gelinas argued that Citi Bike should do more to warn its users of the risks posed by large trucks. While a better solution — for pedestrians as well as cyclists — would be to make the trucks themselves safer by designing trucks with fewer blind spots, requiring crossover mirrors, and enforcing the city’s permit requirements for large trucks, this is at least a good step in helping bike-share users be aware of the dangers large trucks pose on city streets. 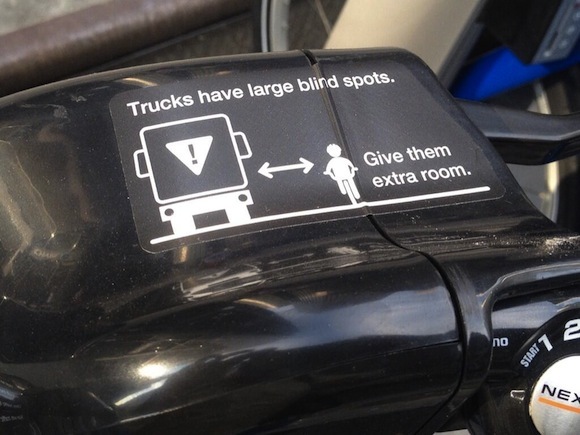 I’d like to see these stickers posted inside of trucks. I’m actually glad to see this! Many cyclists assume that cars and trucks can always see them if they can see the vehicle. Which, especially with trucks, isn’t always true. Now can we get a sticker in the cabs of trucks reminding them not to speed or run red lights or park in bike lanes? The bikes should also come with sticker warning that the NYPD, with apparently nothing better to do, will be handing out tickets for technical infractions right and left, and occasionally will violently pull cyclists off their bikes. All of the above have happened to me. Will that fit on a sticker?